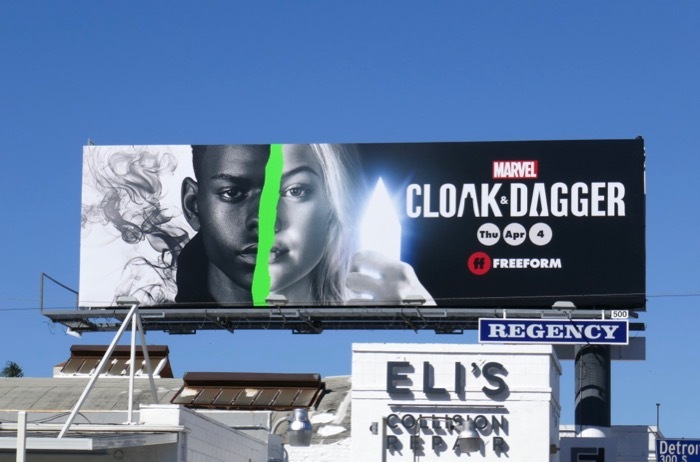 Last June Marvel's Cloak & Dagger leapt from the comic book page to the small screen courtesy of Freeform's live-action series. Set and filmed in New Orleans these teenagers of shadow and light are back for a sophomore season of misadventures this April. 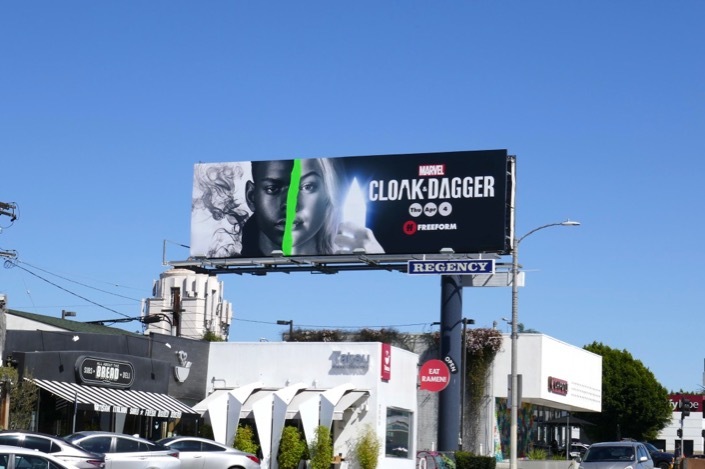 In this reimagining of their origin story this connected superheroic duo received their powers from an accident at a Roxxon oil rig when they were kids and last season they used their abilities to stop the nefarious corporation from infecting their city with dark energy. 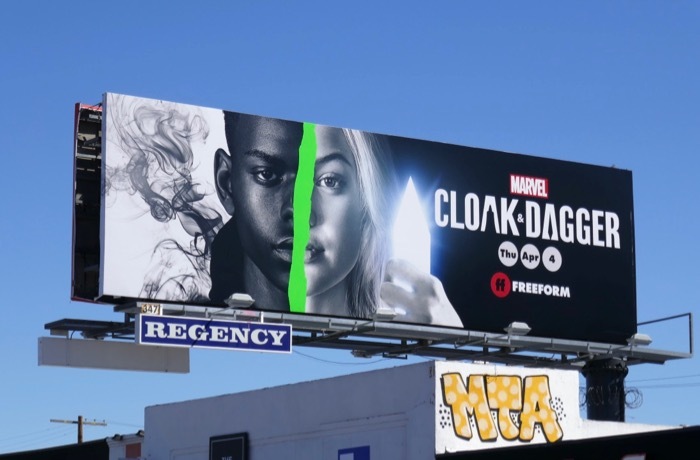 Olivia Holt returns as former runaway, thief and con artist 'Tandy Bowen' who can generate daggers of hard light and see people's hopes, whilst Aubrey Joseph reprises his role as 'Tyrone Johnson', the teleporting hero cloaked in shadows who can see people's fears and witnessed a corrupt cop shoot and kill his brother when he was younger. 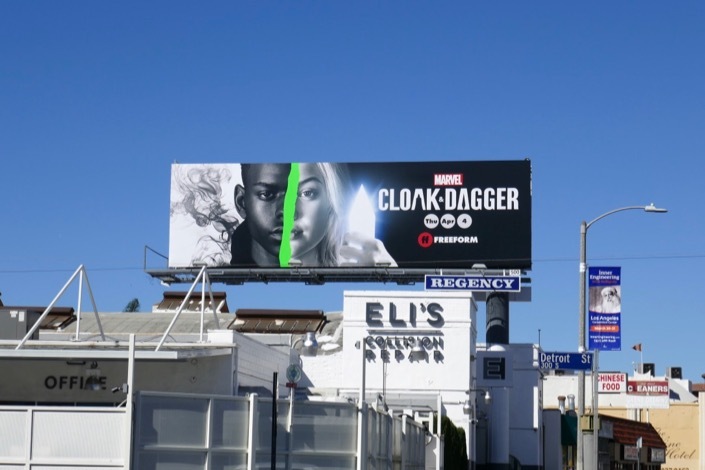 These sophomore season billboards were spied along L.A.'s Melrose Avenue and 3rd Street on March 13, 2019. 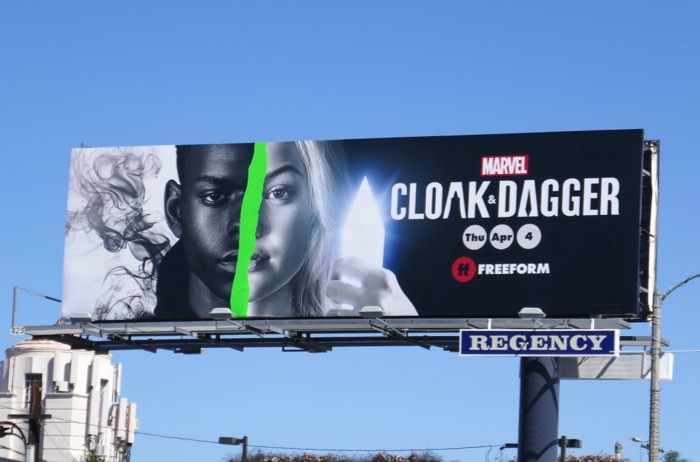 That slash of vivid green between the two teens probably signals the arrival of 'Mayhem' from their comic book series, and even though Emma Lahana's 'Detective Brigid O'Reilly' was shot and left for dead last season, it appears she may have crawled back out of the New Orleans water with powers of her own. But will she be friend or foe this season. 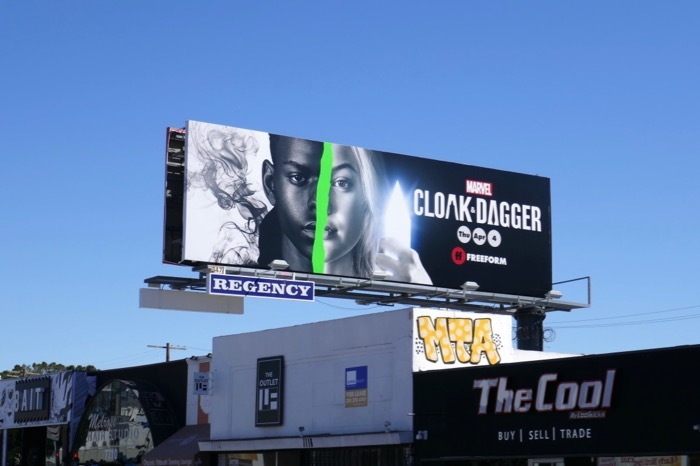 Fans of the Marvel television series on Freeform can also enjoy these season one billboards for Cloak & Dagger. Tandy is back living with her mother, whilst Ty fled his seemingly perfect life after being framed for the murder of a cop and hiding old in the old abandoned church she used to live in, but as their relationship and powers continue to evolve this season, will this crime-fighting duo become more than just friends in these all-new episodes. Get ready for some light, darkness and a ton of mayhem.